A broadside from 1876 reproducing a postscript to the Pennsylvania Gazette from December 24, 1773 about the destruction of tea in Boston. This notice reports on the events of December 16 including the efforts of Mr. Rotch, owner of the Dartmouth, to negotiate between the demands of the colonists and his legal requirement to turn over the tea to customs officials. The notice also reports on the colonists’ mass meeting at Old South Meeting House, and ultimately the destruction of the tea. 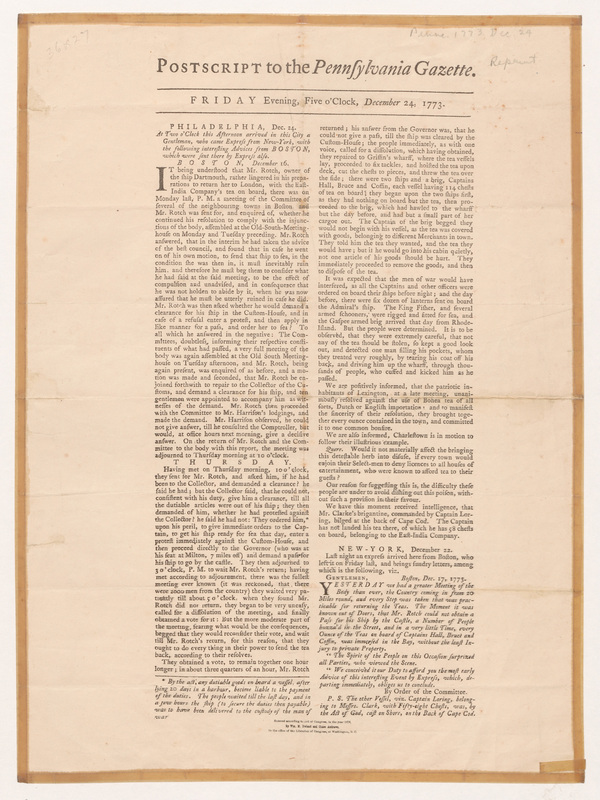 “Postscript to the Pennsylvania Gazette announcing the Boston Tea Party,” Digital Public Library of America, http://dp.la/item/10f99c5a7b19f155bd95b08a815e579d. Courtesy of Duke University Libraries via North Carolina Digital Heritage Center. A petition to the selectmen of Boston for the resignation of the tea consignees, November 17, 1773. A broadside reporting a meeting of the people of Boston at Faneuil Hall on November 29, 1773 to prevent the sale of East India Company tea. A view of the port of Boston, including Long Wharf, ca. 1750-1799. A map of Boston around the time of the American Revolution, including Griffin’s Wharf where the ships of the Boston Tea Party were docked. An illustration titled “Destruction of Tea in Boston Harbor,” 1856. An illustration depicting the Boston Tea Party, 1881. An illustration depicting the Boston Tea Party, ca.1900s. An excerpt from Traits of the Tea Party, a memoir of George Hewes, a Tea Party participant, 1835. An excerpt from Tea Leaves, an 1884 collection of letters and documents relating to the Boston Tea Party. A notice from Boston announcing the British law blocking Boston Harbor until the East India Company was compensated for its lost tea, 1774. A cartoon titled “The Bostonians in Distress,” published in London, November 1774. A political cartoon, “Able Doctor, or America Swallowing the Bitter Draught,” published in both London and Boston in May and June 1774. An engraving published in London titled “The Tea-Tax Tempest,” 1778.